Bolton School uses GL Assessment and we focus specifically on the practice packs supplied by this examination board. Verbal reasoning is, in a nutshell, thinking with words. ‘As the name suggests, it’s a form of problem-solving based around words and language,’ It involves thinking about text, solving word problems, following written instructions to come up with a solution, spotting letter sequences and cracking letter- and number-based codes. Verbal reasoning exams are intended to test a child’s ability to understand and reason using words, and are a test of skill, rather than of learned knowledge. The theory is that they allow the examining body to build a picture of a child’s potential for critical thinking, problem-solving and ultimately, intelligence. 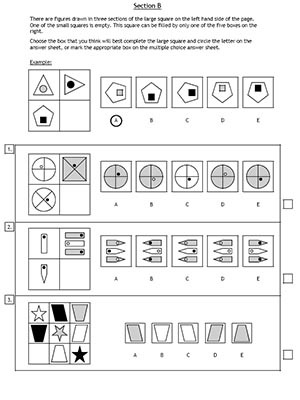 Non-verbal reasoning is not part of the National Curriculum in state primary schools, and this style of assessment may feel very alien to children who have not seen it before. Some children will pick up the logic and patterns used in the question types very easily, whereas for others these will pose a considerable challenge. These tests are often used in 11+ testing, however, and therefore familiarity with the different question types used within non-verbal reasoning tests may be critical. Contact us for more details and enroll your child before it’s too late. Classes will be held in Bolton! Rachel is a very friendly tutor and my daughter feels comfortable working with her. She has now improved my daughters ability a lot.